The Kings Head & Bell on East Saint Helens Street is now being managed by Noreen and Aidan who took over the pub in December. The pub usually has a changing selection of 3 real ales, but this weekend (Thursday 16th until Sunday 19th) is the spring beer festival featuring a range of Oxfordshire ales. For every pint that is sold, they will be donating 10p to the Air Ambulance charity. 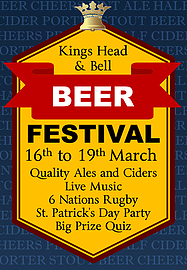 Next month we can also look forward to beer festivals from the Black Horse at Gozzard’s Ford (14th-17th April), Brewery Tap (21st-23rd April) and the Nags Head (28th-30th April).